The Quality Of Locator®, But Exceptional Value! 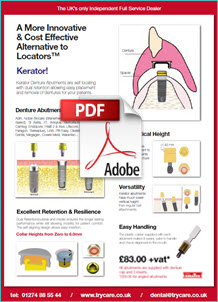 Kerator overdenture abutments are available for both implant and root retained overdentures. 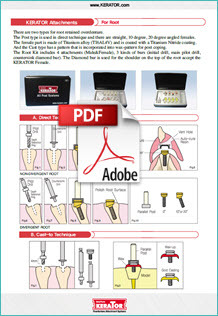 The Kerator pack contains inserts, cap and an abutment (angled abutments are provided too). Kerator abutments are strong, stable and long lasting and are are attached to plastic carriers for easy handling and attachment. Kerator abutments are compatible with most implant systems including Adin, Nobel Biocare (Branemark, Sterioss, Replace, Replace Select), 3I, Astra, ITI, Ankylos, Biohorizon, Biolok, Bicon, Camlog, Endopore, Frialit-2 & Xive, Lifecore, Zimmer (Calcitek, Paragon, Swissplus), Uniti, Pitt-Easy, Osstem, Dentium, Dio, Dentis, Megagen, Cowell Medi, Warantec and many more. 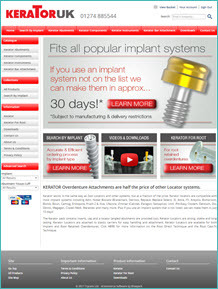 If your implant system is not listed or you are unsure which abutment you need, please visit our Kerator abutment website and choose the relevant implant manufacturer. 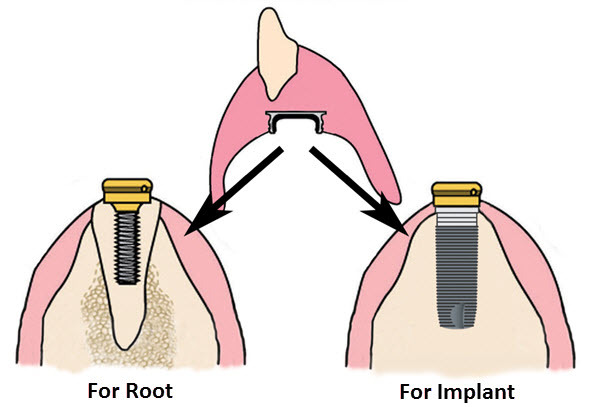 After selecting the implant type, the correct abutment will then be shown to you, but should your manufacturer still not be listed, please call us on 01274 885544. Kerator implant abutments also have components, instruments and bar attachments available. The post type is used in direct technique and there are straight, 10 degree and 20 degree angled females. The female part is made of titanium alloy and is coated with titanium nitride. 15° Angled abutment can be used with non-parallel implants. Combined with the extended range male, it can correct up to 40 degrees. A cross section of the Kerator metal housing shows the retentive property; Increasing coherence with denture resin.